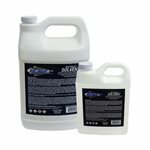 Rust Bullet Automotive Formula now has only 97 grams per liter of Volatile Organic Compounds. It's the same great protection, but now Rust Bullet Automotive Low VOC is compliant in all US states and air quality management districts. Rust Bullet also contains no zinc, no chromates, no acids, and no heavy metals. Rust Bullet Automotive Low VOC contains more metal and is a bit thinner than the Industrial Formula allowing for easy application with HVLP automotive finishing guns, as well as brush or roller, and provides a smoother finish usually desired for automotive projects. 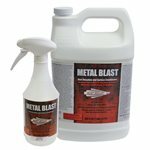 Rust Bullet is a one-step corrosion control solution for protecting rusty or clean metal. 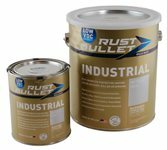 2-3 coats of Rust Bullet Industrial Low VOC provides effective low-maintenance, long-lasting corrosion prevention. No primer is required under it and no top coat is needed over it to get years of protection. Of course if you would like a specific color top coat, almost any paint can be applied over Rust Bullet. Rust Bullet can be re-coated or top-coated between 4-6 hours after the previous coat has been applied with no additional preparation. 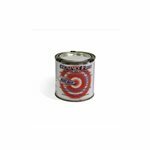 If a finished color other than metallic gray is desired, Rust Bullet is compatible with most conventional top coat paints. 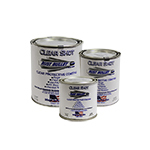 Of course, Rust Bullet BlackShell or Clear Shot are formulated specifically to be superior top coats. Rust Bullet is designed to protect both rusted and clean metal. When Rust Bullet is applied on corroded metal, it does not form a film immediately; first it penetrates to the original metal surface and then combines the rust and coating. The rust is now permanently bound up in the paint, neutralized because it is cut off from water and oxygen. It is always advantageous to protect metal, even when there are no visible signs of corrosion. If Rust Bullet is applied only in the rusted areas, it will stop the rust on that surface area, but the uncoated area will be left unprotected. Remember, if it’s made of iron or steel, it will rust and corrode if left unprotected. Rust Bullet requires basic surface preparation. Clean the surface of any dirt or grease and remove any existing rust or paint that is loose or flaking. Once you are down to rust or paint that is solidly adhering, or to bare metal, you are set to coat the surface with Rust Bullet. For best results 2 - 3 coats of the Standard Formula are recommended, not including any Color Shell or Clear Shot top coats. Please read and follow all instructions before applying the product. Rust Bullet Automotive Low VOC is metallic gray in color. 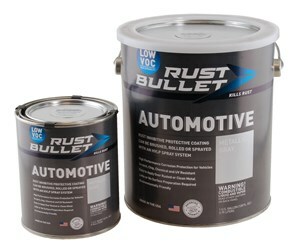 Rust Bullet Automotive Low VOC provides rust protection in two ways. Not only is it a durable barrier coat that seals off metal from corrosion inducing water and oxygen, but Rust Bullet has a high metal content in the paint as well. The metal in the paint gives it a sacrificial metal aspect. If the paint layer becomes compromised, the aluminum in the paint begins to oxidize before the metal substrate underneath. This give Rust Bullet an additional measure of rust prevention that other coatings don't have. Have more questions about Rust Bullet Paints? See our Rust Bullet FAQ's and Other Rust Bullet Articles.